Today’s article is written for the Reach To Teach Teach Abroad Blog Carnival, a monthly series that focuses on providing helpful tips and advice to ESL teachers around the globe. I'm hosting this month's carnival, and here's where you can read the rest of this month's posts. I'll be posting a new ESL-related article on my blog on the 5th of every month. Check back for more articles, and if you'd like to contribute to next month's Blog Carnival, please contact Dean at dean@reachtoteachrecruiting.com, and he will let you know how you can start participating! Prompt: Who is best to teach? Adults? Teens? Kindergarten? Which group do you love teaching and why? 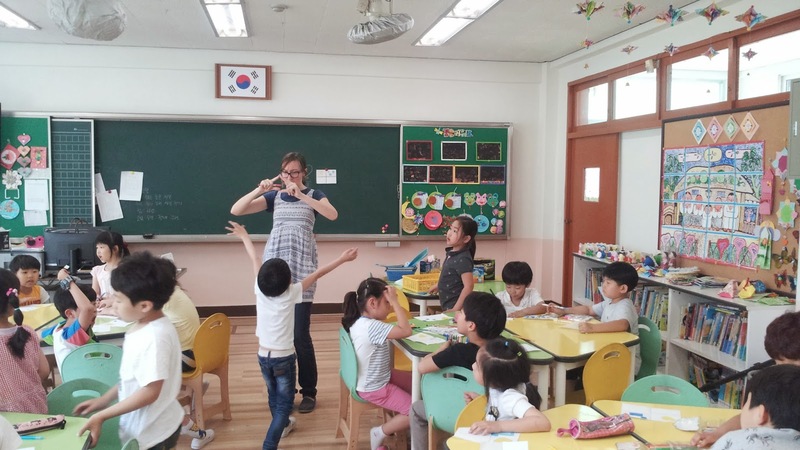 I had never taught a full class of elementary students before I taught in Korea, other than the few times I'd volunteered in my mom's second grade class. 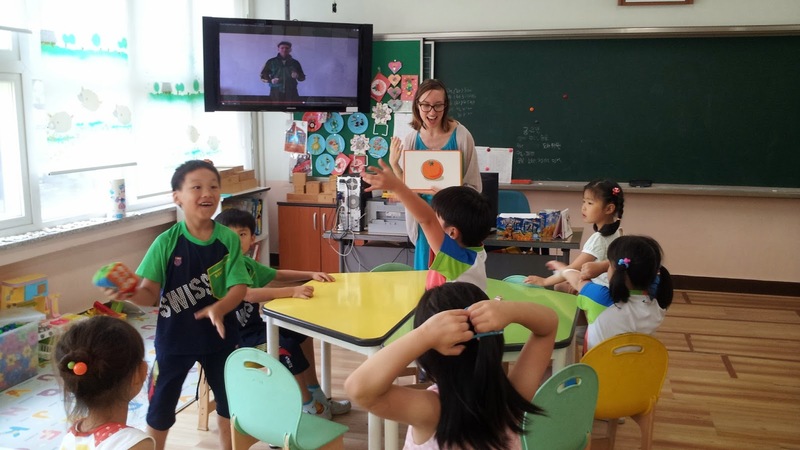 On our application form to teach in Korea, you could check a preference box for elementary, middle, or high school aged students. I wasn't sure which group I would like teaching the best since I hadn't experienced all three, plus I like to be flexible for others, so I checked the "no preference" box. 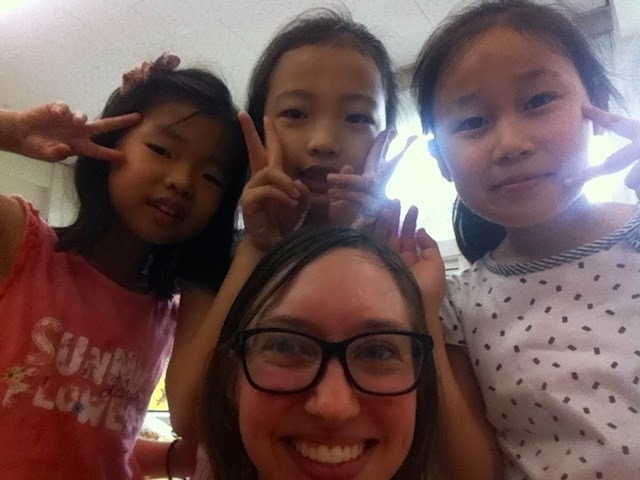 After teaching at an elementary school for a year in Korea, I can happily say that I had a really great time with my young students, and I'm so grateful to have been placed in an elementary school. Maybe it would have been just as good in a middle or high school, but I think the experiences must be distinct. 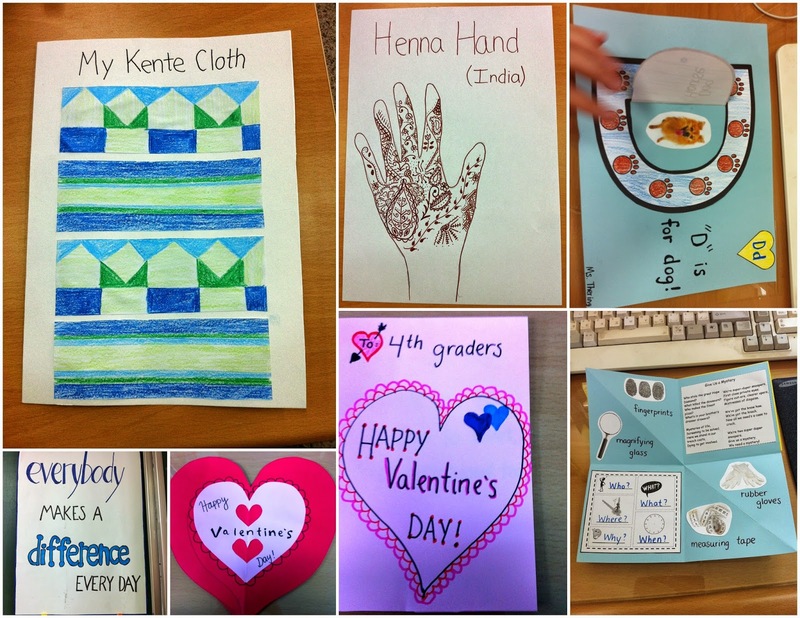 Nothing compares to the young first and second graders—even the crazy ones. So adorable! They never failed to bring smiles to my face every day, which was so needed and appreciated. Maybe my opinion would be different if I could have understood what the kids were saying when they spoke in Korean, but from what I could hear in English and observe, those kids still had lots of childhood innocence. It was refreshing and hopeful. I will never forget how hyped up and excited these students—from the youngest all the way to the sixth graders—have gotten over "points" while playing different games during the year. The points didn't count for anything, they didn't accumulate, and with two of my three co-teachers there was never candy involved. But man did those kids get ever happy when they won points, and completely devastated when they didn't. The "Four Corners" PowerPoint game (a variation of Telepathy) always brought loud cheers and shouts when points were revealed each round. In Spain I taught English in two public vocational schools, so the students' ages spanned 16 - 40, and many were very close in age to my 22-year-old self. They hardly talked in English. Ever. I really had to twist their arms to get anyone to speak when I'd have half the class for "conversation time" in the next room. And in Korea there are certainly still shy students, just like I was in elementary school, but there are so many more kids that aren't yet concerned with fitting in. They'll speak their minds, try and make mistakes in English, be funny in English, and it's wonderful. I've found that the younger they are, the more they talk. My first and second graders had no shame in trying to say anything to me, as you'll see in #6. Making samples for the coloring sheets/projects I had my younger ones do in after school daycare class, or for winter and summer English camps, was really fun. Without the elementary students to make examples for, I probably never would have held a crayon in my hand this year—which is a really scary thought! As I mentioned above, the younger students tended to talk more freely. In my second grade after school class, one day during our start of class routine, a student answered my "How's the weather? with "It's snowy!," even though it was May and hot as ever. Since they're so young I played along and put a confused look on my face. "Really?! It's snowing?" I said as I put one hand above my eyes and looked out the window. They cracked up and thought this was just the funniest thing, so of course, from that day forward someone usually would say an opposite during our weather talk time. Another day one boy randomly answered "Chicken" on purpose when I asked "How are you?" and the whole class thought it was absolutely hysterical. "Dynamite" was another answer I got from someone in the same class, and students then rotated between the two as funny answers to any question during all the weeks that followed. It never lost its humor to them, despite the repetition. I enjoyed playing along with their cute childish humor, and being silly whenever the opportunity presented itself—to please the kids and enjoy the time. Dancing with my young after school classes was another fun part of teaching the youngsters, though some days I'd even dance along to the older kids' textbook songs, mimicking the ridiculous animated video dance moves that accompanied. Even though I was the youngest teacher at my school, and still felt very young myself, my elementary students thought of me as a full-adult teacher. I mean, you know how it is when you're a kid: Anyone over the age of 16 seems so old to you. But do you get what I mean? I didn't have to win anyone over or deal with super judgmental teens or young adolescents. I didn't have to prove myself first, even though I think I did "win them over," as I really cared about those kids and they saw it. What a great release to sing the "Friday Song" with my little ones every Friday, or to belt out Frozen's "Let it Go" in class with students. One day during the summer, one of my co-teachers taught "You Are My Sunshine" to our fifth graders. so I got to sing that song a bunch of times that day. And while it was annoying to have the book's songs constantly stuck in your head—whether I was at school, at home, or with friends on the weekend—I still thoroughly enjoyed singing that year. It had been a long time since I had thought back to my elementary school days. But so many things during the year caused me to reflect back on my own elementary life. Why had I taken everything so seriously? Why did I spend so much time on little silly elementary projects? Why was I so shy? I wish I'd known it was okay to just open up and say whatever I was thinking—kids can be kids. If this is what I think now about my elementary self, what will my future self want my 25-year-old self to know now? I'm glad that I was able to think about these things during the year, as I'd often try to put myself in the shoes of my students. What was my understanding of the world in 6th grade? Other elementary teachers out there, what do you like about teaching this age level? Yeah, I had them make the alphabet with their bodies one day—and I "checked" by taking a picture, then wrote down a new letter for them to make. It was a fun class! Great thoughts :) Even though I only taught elementary for a few days this year, I had a great experience and can definitely relate to all of these points!